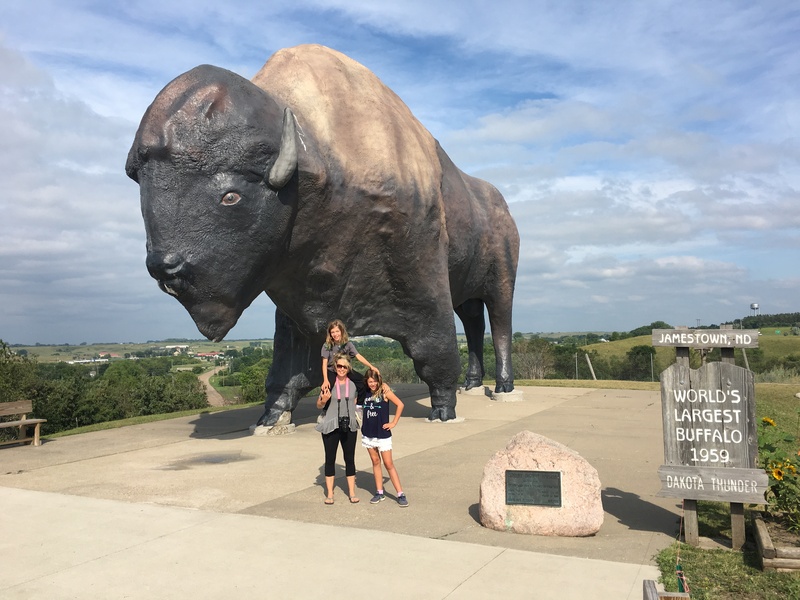 We had a long drive to Minnesota so we stopped over in Jamestown, ND to check out the world’s largest buffalo. But first, on the way to Jamestown from Medora, we detoured to the Enchanted Highway, off of Hwy 94. I had read about the The Enchanted Highway in the On the Road USA book Francey gave us. It’s a 32 mile stretch of highway, that features the world’s largest scrap metal sculptures. The highway consists of 6 extremely large sculptures by Gary Greff. We drove 15 miles of it and saw half of them. We saw Geese in Flight built in 2001. This one is currently listed in the Guinness World Book of Records as the Largest Scrap Metal Sculpture in the world! We had so much fun with Grasshoppers in the Field built in 1999. MF was about to be eaten by the grasshopper. and Deer Crossing built in 2002. We also saw this giant cow statue but I didn’t get a picture because I was too busy looking up information about it. The page I was reading said that the sunflowers didn’t flower until mid August and the farms on the list were back the other way. Just as I was accepting the fact that we wouldn’t get to see any of these sunflower farms….ta da! Right off the highway. Those of you that own an RV with a tow probably immediately realized the situation I may have been in- If I saw the farm on the right as we were passing by that means we’d have to turn around if I wanted to get pictures. This is no easy task when towing a vehicle because you can’t back up or flip a u-turn so asking Chris to risk getting off at the next exit and back tracking without knowing where we’d be able to park or turn around was no easy task. But I do have the best husband in the world, that loves me and gets my love for photography and nature, so he made it happen. We got lucky finding a parking lot that we could pull into and walk to the edge of the field. I had read online that farmers don’t mind strangers photographing their flowers as long as they don’t cut them down. We were very careful and just snapped a few pictures. There is just something about these yellow giants that makes you smile. It’s tricky photographing people with the sunflowers because the flowers follow the sun. In order to get a picture of the person, they have to be looking in the direction of the sun..hence the squinting. Well here it is…. the moment you have all been waiting for…the World’s Largest Buffalo. Jamestown is a nice old style western town with horse, goats and bison grazing. There is also a rare white Bison that roams around but we did not see her. The town is free to explore but donations are accepted. You can walk in all the buildings and learn about all the antiques. There is a firehouse, jail, post office, saloon, dentist and more. It reminds me of Williamsburg, VA.
Mackenzie lost one of her teeth, driving out to the statue. It’s the first one while on this adventure. She was excited to see that the tooth fairy was able to find us. LOL! Yes! It’s unreal. I haven’t seen so many large statues in one area. Have you? Well in Queensland Australia they like the big pineapple, the big banana and the big everything. So maybe I have seen the same amount – depend just how many there is in the dakotas.